Bluetooth speakers are a dime a dozen. You’ll find them pretty much in all corners these days, from the office to the streets where annoying teens jam their tunes. While wireless headphones have also become a popular staple for most kids lately, the Bluetooth speaker is a particular favourite among small crowds of friends. The great thing about the increased popularity of this type of portable speaker is that, while it may have diluted the pool, it has also created a few gems for the market. 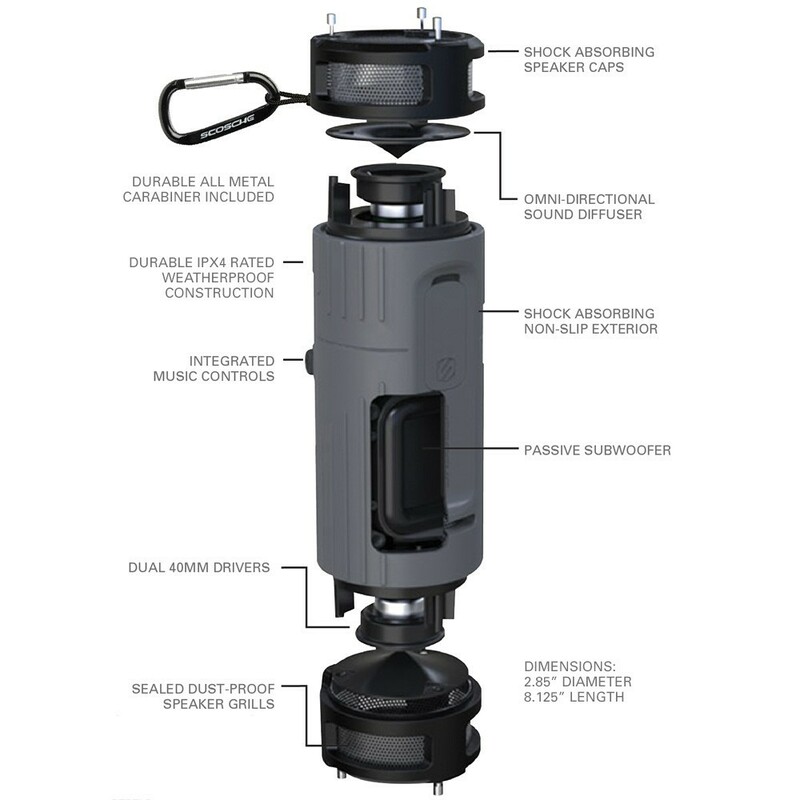 Scosche’s BoomBottle+ aims to be one such device. There are three main types of Bluetooth speakers available today, the home speaker replacement, the miniature pocket speaker and the boom box replacement. There are, however, a few exceptions to the rule. The BoomBottle+ is one such exception, offering a portable speaker for active users. While the company may be relatively unknown in the South African circle, it doesn’t mean that the BoomBottle isn’t a solid and capable speaker. Often times we some strange and remarkable designs when it comes to the Bluetooth speaker, most of which have some level of form follows function approach, while others seem only to be attempting something different. The BoomBottle+, however, was designed specifically with those on the go by taking the form of a water bottle. The cylindrical design and size makes it an ideal fit for your car’s cup holder, bicycle bottle holder, and pretty much anywhere you find such an opening. In addition to this, it’s IP67 rating also means that it can withstand a fair amount of spillage and dust in the different environments you find yourself. The ruggedised rubber also makes it an ideal partner as it’s able to withstand quite a reasonable amount of abuse. Furthermore, while being rugged and portable, the unit also floats on water, allowing to enjoy some tunes while having a swim, or simply relaxing in the pool. And if you don’t have a bottle or cup holder to mount your BoomBottle+, simply pull out the handle and have your device hang around from almost anywhere you need it to. There’s also a mount below the unit to allow users to screw it into a tripod or other stands. Quite a nifty addition. The unit is available in Black/Grey, Gold/Grey and Sports Blue/Grey, the one which I received for review. Almost all aspects of the device’s design are oversized, making it easier to use while active, while wet, or while covered in the dirt without having to spend unnecessary amounts of time trying to figure out which buttons are which. This design has been streamlined over the previous BoomBottle that went before it, making it much easier to use the device without needing to look at the buttons themselves. The BoomBottle+ supports Bluetooth 4.0, and as with most other speakers using Bluetooth, has a connectivity range of around 10m. 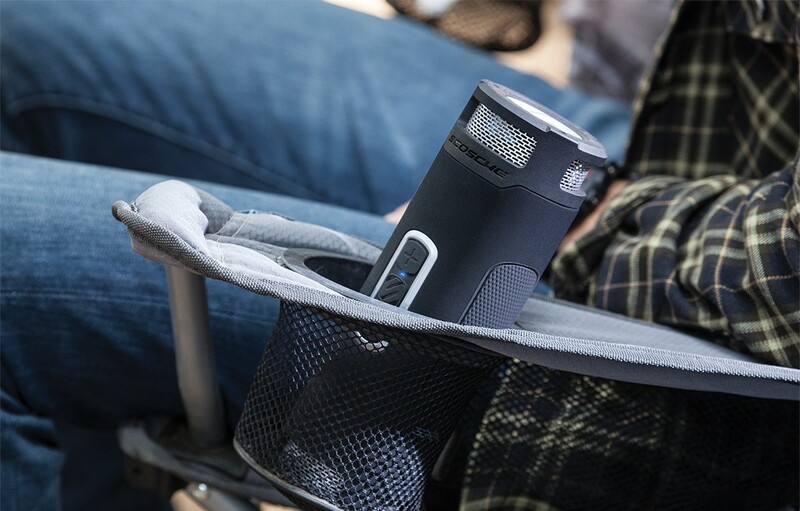 The speaker also allows for dual Bluetooth connectivity, which allows you to connect two such devices at once, as a means to create stereo sound at a party. Setting up the connectivity to your device is as simple as a long press of the power button to turn on the visibility of the unit allowing you to pair with your source device. For those who wish to setup up two devices for stereo sound, you’ll follow the same pairing steps, with only one additional change in the form of switching the device to the left or right side speaker by means of a switch underneath the waterproof flap. The BoomBottle+ isn’t your average Bluetooth speaker but offers a bunch of nice-to-haves alongside reasonable quality sound quality. Apart from its waterproof and dustproof rating, and left and right speaker capabilities for stereo sound, users can switch between indoor and outdoor modes. There’s a noticeable difference between the two, with the indoor sound quality a lot clearer and crisp across the different frequencies. Another great feature is that the unit is able to act as a charging port for your mobile device whether or not you’re charging the unit itself. A nice to have while you’re away from an electrical plug to charge your smartphone while spitting out a few tunes. The average play time for the speaker is around 13 hours of continuous usage. 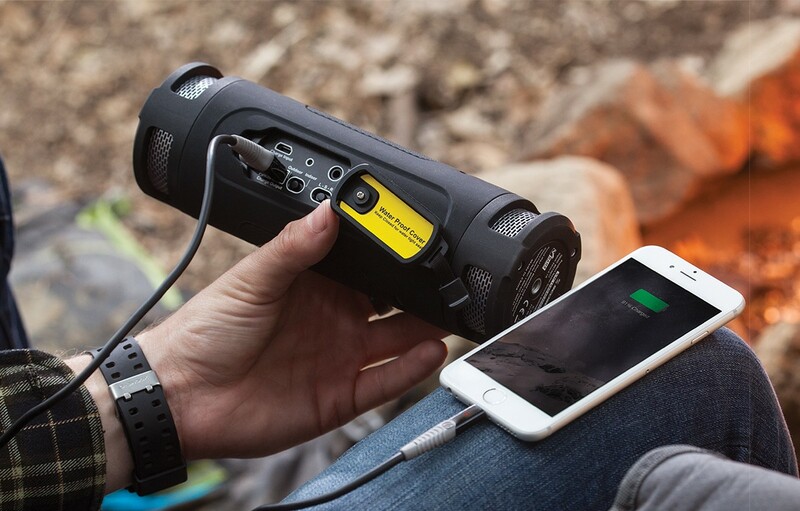 This falls within the specified battery life from Scosche, which claims a 12 to 15-hour life on a single charge. Results do vary during playback, especially if you’re using the BoomBottle+ to charge another device at the same time. The unit packs a 6,000mAh battery, which takes roughly three hours to fully charge from being fully drained. This is quite a lengthy charge time, but with 13 hours of continuous play, it is reasonable. In terms of the sound quality, the BoomBottle+ does a good enough job for an outdoor, Bluetooth-enabled speaker. Given its cylindrical shape, the unit projects 360-degree audio, which is a huge plus. Undeath the rubber coverings you’ll find a pair of 50mm drivers and a passive subwoofer. The frequency outputs range from 150Hz to 20kHz. The volumes are quite good on the device, especially when switching to outdoor mode, although the quality is slightly reduced as a result. There’s a mixed bag of results in terms of reproduction of the highs, lows and midranges. Given that the unit is mostly sealed off for waterproofing, you don’t get the required airflow to produce great sounding deep bass. Despite it being sealed off, you won’t find too much hindrance in terms of box sounds. It’s hard to describe the overall sound quality of the portable speaker, as the sound isn’t muffled, but at the same time isn’t as full as it should be. To explain it in the most basic of terms is to say that the audio is missing the complete rounds in terms of its range and levels. Switching to outdoor mode means turning up the highs and high mids to boost sound range. This is handy in an outdoor setting, although the bass levels tend to suffer as a result. That said, the unit projects its sound quite well at high volumes and there’s no challenge to tackle the outdoor setting of playing tunes on the go. The market has been inundated with new Bluetooth speakers almost every other day, so being on top of your game will definitely set you apart from the crowds. 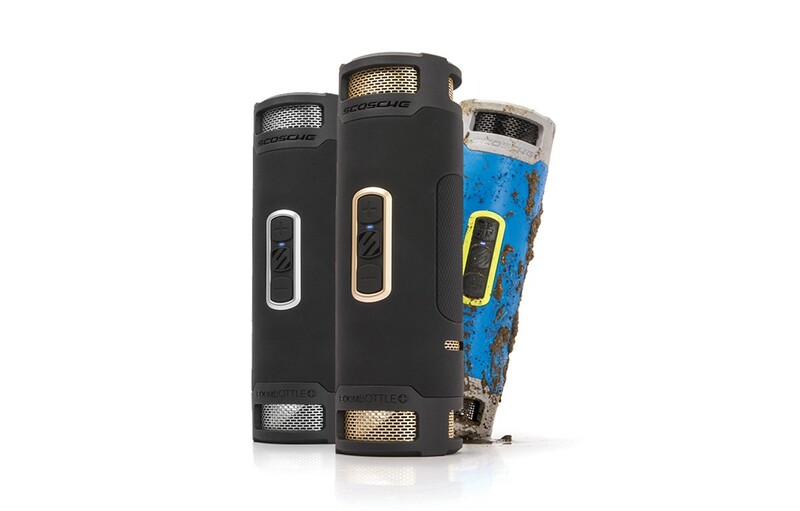 That said, the Scosche BoomBottle+ offers a number of great features that will definitely come in handy. The BoomBottle+ would really have been a top contender for best portable speaker, but due to the lack of great sound on the unit, you may want to do some research before your investment purchase.